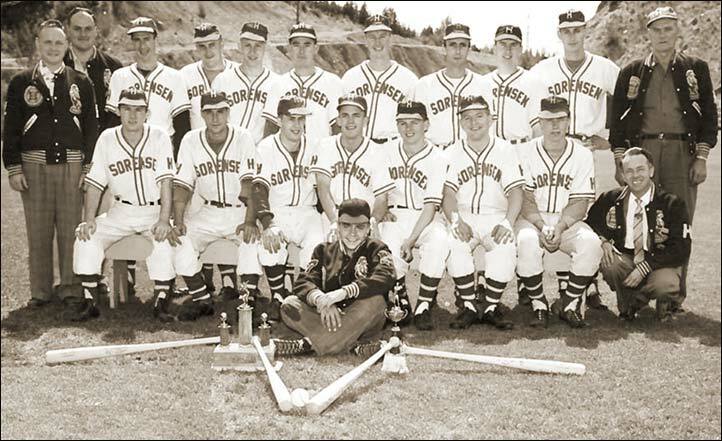 1957 East Kootenay and Kootenay Champions, Kimberley Hobos, sponsored by Sorensen. Standing (left to right) - Chris Sorensen (Sponsor MGR), John Pedrotti (Equipment MGR), Dave Blayney P, Bob Fisher P, Jim Putsey OF, Art King OF, Ed Johnson SS, Dave McLay Coach, Carl/Cecil Ross C, Jim Ratcliffe 3B, Bryn Blayney Trainer. Missing - Alan Jobe, John Stone, Arvon Thomas, Colin Paterson, Elgin Smith, John Kosiancic, Moose Ronnquist, Joe Posnikov, Ed Blundell.